Students will work their way through a maze by choosing the correct conjugations of the verb ir based on a sentence given to the them. It is good repetition with the conjugations of ir as well as recognizing subjects in a sentence. For similar maze activities check out my other products here! This is a 17 slide powerpoint. It's meant to be a review for a test and it covers IR, Estar, Location Words, and Contractions. It covers the main points and has slides for the students to practice. I also upload the file to my website so the students can use it to review at home! Worksheet has 26 fill in the blank sentences with the present tense of IR Spanish verbs. Guided notes for teaching the verb Ir. Includes verb chart, question word adonde, and the contraction al. Puzzle gives an infinitive and a subject for the clue. Students must conjugate the -IR verb in the present tense for the answer. 5 versions with vosotros; 5 versions without vosotros. Students practice using the verb "ir" in the preterit tense to practice telling where people went in the past. Students answer questions to practice using "fui, fuiste, fue, fuimos fueron" in context. Example question: ¿Adónde fueron los estudiantes para estudiar? A PowerPoint to go with notes that I borrowed from a colleague. Blue text is information students will fill in on their guided notes sheet. Esta actividad es práctica en escribir frases lógicas y creativas con el verbo "ir" en tanto que escriba sobre lugares en la escuela. Battleship game for conjugating IR verbs in Spanish. Regular verbs only; may be used for any tense. Mixer activity with 15 unique sets of twins. Each student sheet has 5 statements. Students mingle, trying to find their twin (the other person who has all 5 of the same statements, though in a different order). 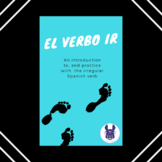 Activity uses common IR verbs in Spanish in the present tense (Tu cubres la mesa). 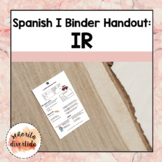 This 1 page, 10 question sheet covers basic knowledge of the verbs "ir" & "venir". There are 8 "ir" questions and 2 "venir" questions. I used this as a quiz for my students but it could also be used as a simple homework sheet or bell work assignment. Print on cardstock and laminate. 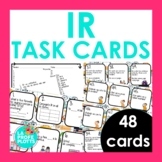 Includes 35 cards using the present tense of 12 IR verbs in Spanish. Suggestions for game variations included. This version of Connect 4 has more squares and so can accommodate 2 or 3 players. Students must correctly conjugate the verb to win the square. The goal is to get 4 squares in a row four times. 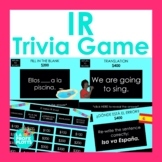 This is a simple worksheet to practice how to conjugate the verb IR. It also includes space to write 2 sentences using any form of the verb.